North Shore Cyclists will host the "Northern Exposure" Ride on Monday September 7. This ride was developed by Charles River Wheelmen (CRW) and is parked with a white letter J. All routes pass through Chelmsford, Westford, Dunstable, and Groton (including Lost Lake). 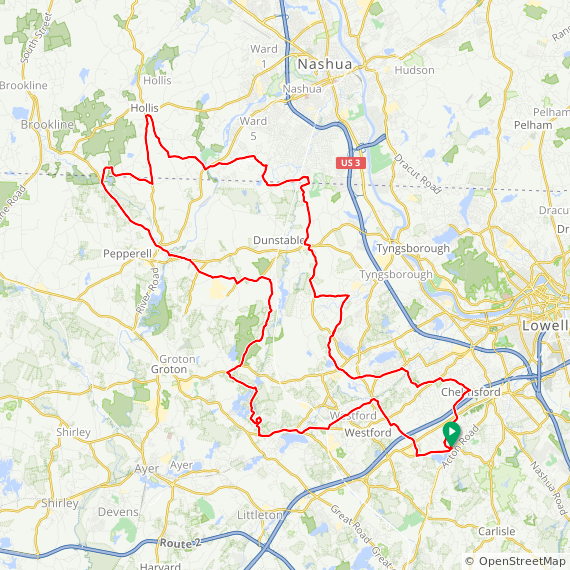 Medium ride adds a bit of Nashua, NH. Long ride adds Hollis, NH and Pepperell to this. Moderate terrain. Short ride and Medium routes are not in RideWithGPS. Follow arrows on road. Cue sheets are available but may be outdated.